Meet YuXi Sun Todd. YuXi is a beautiful seven-year-old girl who was born in Beijing, China, but is now a citizen living in the United States. YuXi was born with bilateral Microtia and Atresia and has lived in an orphanage in China since three months of age. On May 22nd, 2015, YuXi was adopted by her new parents, Lynn and Barbara Todd of Winter Haven, Florida. Lynn and Barbara Todd were on an adoption list for nearly 10 years and finally got the call for little YuXi, but by now they had retired and didn’t have the income they once had 10 years ago when originally wanting to adopt. So, they pulled together the funds they had, took out a loan, and dipped into their savings and retirement to adopt YuXi. The first thing they wanted to focus on with YuXi was to help her hear. YuXi was only speaking a few words of English and when they would repeat words back to her they noticed she was really struggling to hear them and wasn’t pronouncing the words back clearly. After taking YuXi to an ENT who had suggested the use of a bone conduction hearing device, they contacted their insurance about hearing device coverage. Unfortunately, the Todd family did not have coverage for a hearing device for YuXi and were turned away. After spending a couple of thousand dollars on a dental bill for YuXi’s teeth to fix cavities and after the adoption fees there was not a lot of funds available to them for two hearing devices for YuXi. The Todd family was concerned for YuXi’s communication and wanted YuXi to feel comfortable in her new home with her new family. YuXi’s parents were told about the Ear Community Organization and applied for a hearing device for YuXi. On December 22nd, 2015, YuXi was fitted with two newly donated Oticon Medical Ponto Plus hearing devices through the Ear Community Organization just in time for Christmas. Since YuXi has been aided with her two Ponto Plus hearing devices YuXi’s mother, Barbara said ” I will tell you the difference in her hearing is AMAZING!! She is better able to enunciate words, sounds and putting together sentences. I would honestly say she has picked up more English in the past week than in the last 3-4 months. She is singing Christmas carols and along with the radio. 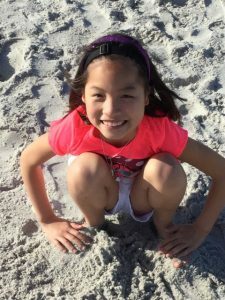 She was talking to her sister on Facetime and really was answering appropriately.” Thank you to Dr. Chelsea McNee of Tampa Children’s ENT for getting YuXi into your office just before the holiday so YuXi could receive the gift of hearing for Christmas. Congratulations on hearing so much better now YuXi! All of us here at Ear Community are so happy that you can not only hear better with your new Pontos but that you are able to hear clearly so you can learn English easier.